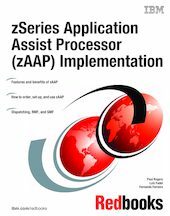 This IBM Redbooks publication gives a broad understanding of a new architecture facility available on zSeries servers called zSeries Application Assist Processor (zAAP). The zAAP is an attractively priced specialized processing unit that provides an economical Java execution environment for customers who desire the traditional Qualities of Service and the integration advantages of the zSeries platform. The objective of this book is to help you better understand the functions available with zAAPs as well as how to install, tailor, and configure the new processors.